Gunfighter shoots 10 targets. Myself, (counting) others only heard 5. A member of the peanut gallery even hollered you only shot 5. TO (who was rightly watching the gun said no, he shot 10) shooter went on and finished stage. I know I only heard 5 shots. Others obviously also only heard 5. I also know that there were no pistol misses. Rule says counters have to be able to discern shots. Clean. I shoot with a guy that can make it sound like only five shots were fired but he’s usually first up and you can see the bullet marks on the targets and you can see different targets move. Hearing isn’t the only sense in play here. He loves to Silverado it and you can see the targets move on each end of the target group and see the bullet marks. 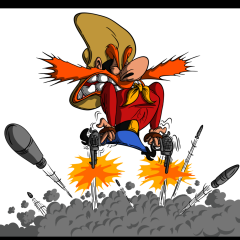 The rule doesn’t say that you have to hear each shot if it did I bet most folks would say Smokestack has a bunch of misses on each stage the way he handles that rifle and you oughta see him shoot gunfighter now. You need more than just hearing to count for him. 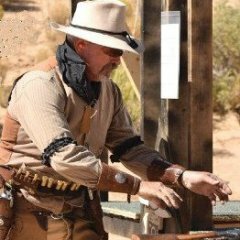 From the Handbook in the category rules for GF: "Both revolvers may be cocked at the same time but must be shot one at a time to facilitate scoring. " From the original post, this was not done. Therefore, it's a P for not following the rules of the category. I was caught in this dilemma once also.. I was spotting for a gunfighter and only heard 9 shots.. He was putting his pistols away when I said one more..
Another spotter said "No.. He shot 2 pistols at the same time." When the stage was done.. I held up one finger for one miss..
because I only heard 9 shots..
Thinkin' that doesn't seem right on my call or is OP's call?? The "P" I agree with.. The no call.. I don't..
Freshly painted targets and first shooter maybe different cup of tea.. I still need 10 sounds.. THIS ^.......... Except the TO discerned 10 shots and made the final decision on this particular call. Shooters from the P'nut gallery have no input. Because you only heard five shots doesn’t mean they were shot at the same time. Some gunfighters are so fast it’s hard to hear separate. shots. This ^ needs to be enforced. It's important for a Gunfighter to keep the shots separated to facilitate BOTH safety and scoring. Simo shooters can make a mistake on target sequence that no one sees, or adjust target sequence to be simpler. No other shooter can (at least none of them I've ever seen). Simo shooters can cover up a squib or a round not fired because of the other gun's report. Not saying they do as a regular part of their run. But just ASSUMING that a gunfighter fired the required number of shots and got the target sequence right does not qualify as scoring, that is guessing. Scoring and safety rules require separation of reports sufficient that spotters can count and sequence the shots. Spotters may not be over-ruled in regards to misses. And the TO should rely on their input for other penalties. But... there are very distinct differences in how we discern. 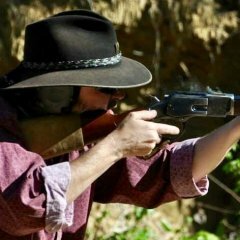 I've observed gunfighters that have been accused of simultaneously shooting both revolvers, but as TO have seen a distinct lag between the recoil of 1 revolver and the second. And yet, could barely distinguish the separate shots... And others had even more trouble. But, as the TO it's my job to make the call. Monday morning quarterbacks notwithstanding. TOs should be supported in making the call, be it popular or not. This is a rule that needs to go away. No other category is punished for going too fast. Or doesn't get the benefit of the doubt. A squaw gripper shoots fast enough it's hard to follow and everybody says, must have got it right. B.o.d. a gunfighter does it and they must have done it wrong. To answer the question. The TO heard ten. End of story. Clean next shooter. Peanut gallery needs to stay out of it. Oh please, no other type of shooting allows for two revolvers being shot at the same time. I ain’t gonna debate this. I will offer up just one thought. The only way it’s viable for no split between shots is if there’s no sequence and targets are freshly painted between shooters. Otherwise, there’s no way for spotters to do their job for calling hits to verifying that targets were hit in the correct order. I won't spot for a double cocker. Lack of confidence in my ability to read the shooters mind. I agree with the P, and in my opinion, for what it's worth, we should not remove the penalty for shooting both guns at the same time. I don't care how "fast" anyone shoots....more power to them. But the rules say you can't and it's really for good reason. If you stand behind a shooter that's double cocking and doing it fast 9 times out of 10 no one knows what happened. Good spotters or bad spotter's usually ends up the same. How do you really score for that. Heck we hear a lot of complaints about getting good spotter's the way it is......you really want to put them to the test try spotting for these folks. Many times they just try to hear 10 dings and call them clean. When I'm running the timer and I clearly saw 10 leave the pistols but are close, but distinct, I'll get with the spotters and tell them what I saw. I cannot overrule them but I can provide info like we do with an edge hit. If the double cocker is shooting shots close to simultaneous, I'll let he/she know it's too close and the spotters may be calling misses or I may have to call a P. Two close is if I don't see one gun recoil before the other. I can't always get into position to see that, but I try. Double cocking is not an issue. Firing both guns off at the same time is the debate. 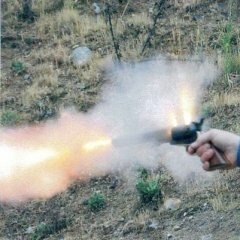 When I first startled shooting gunfighter I double cocked all the time but single fired. I'm slow and take aim so trying to hit a target, even a double tap, is something I would have to practice to even try in a match. I'm getting to where I'm cocking one pistol at a time but still slow. I'm ok with that. Members of the peanut gallery could use some advice I got from Big John Denny. When you're in the PG and you see something that you think is wrong happen on a stage (non-safety related) immediately raise your hand and place it firmly over your mouth. You did your job and called no misses. The TO says he fired 10 shots without a P. The TO is the final authority on Ps. He's clean. to actually KNOW what happened for both Pistols and Rifle. give their input concerning the 'P'. Contrary to popular belief it seems, the TO is the person who decides if there was or was not a procedural. If the TO says no P, then the discussion is over. So a TO can overrule a valid P? I have run into that rule a few times. I have run into some GF that are really fast. You have to pay very close attention. Technically there is no way for nerves impulses yo get muscles to move triggers simultaneously. Thus both guns cannot fire simultaneously. Granted fractions apart. I know what the rule is trying to facilitate but it becomes subjective. Some go coi or not tell others no problem. I was talking in general not this specific instance. I would say your choice of words are incorrect. A valid P will be called by a competent TO. But the P call is either accepted or rejected by the TO. Them are the rules...always have been for as long as I can remember. say as to how it should enter into the score sheet. So the TO can reject a valid p call by a spotter. And if a valid call was overruled by the TO? If someone is acting like what you're are saying, then they are cheating. What's the penalty for such an infraction? Maybe I need to start another topic. You mean if your TO is cheating???? I think those type things get handled at the local level. I know when I was an MD there were instances where I received reports of bad calls by TOs and when I investigated and determined that what was reported had in fact occurred I ensured those people didn't run the timer anymore.